When I came across this recipe, I was so intrigued. A regular cookie that tastes like an Oreo? A cookie dough that has no eggs in it? I knew I had to try it! And I am so glad that I did, because these are delicious!! The flavor does in fact remind me of an Oreo, although a much better one!! 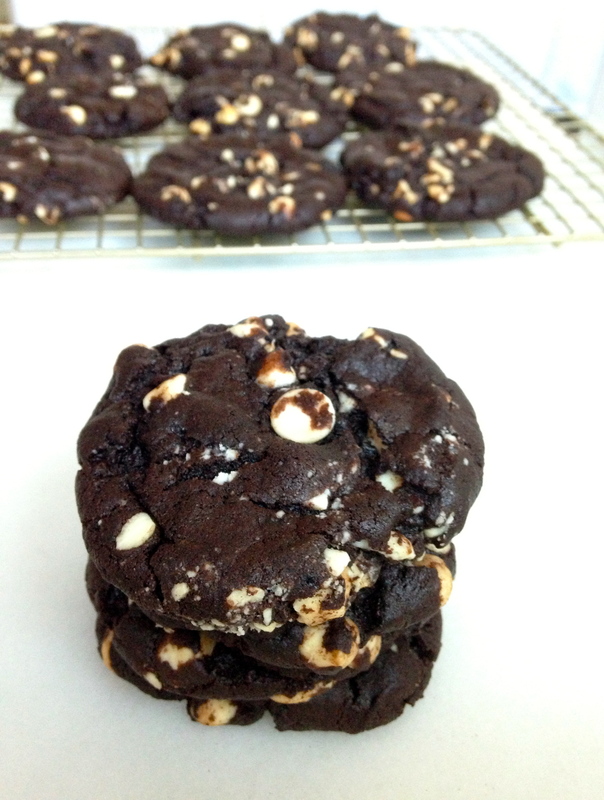 The cookies are rich in chocolate flavor, and the white chocolate chips are the perfect complement to the fudgy cookie. I have never baked cookies without eggs, but somehow it worked! And because there is no egg in the dough I can eat it without TheBetterHalf telling me that I’m going to get salmonella! (TheBetterHalf: CateyLou is going to get salmonella. It’s inevitable. Don’t say I didn’t tell you so.) I ordered some of this cocoa powder from King Arthur Flour, and I think it is the best cocoa powder I have tried. It is so rich in flavor! 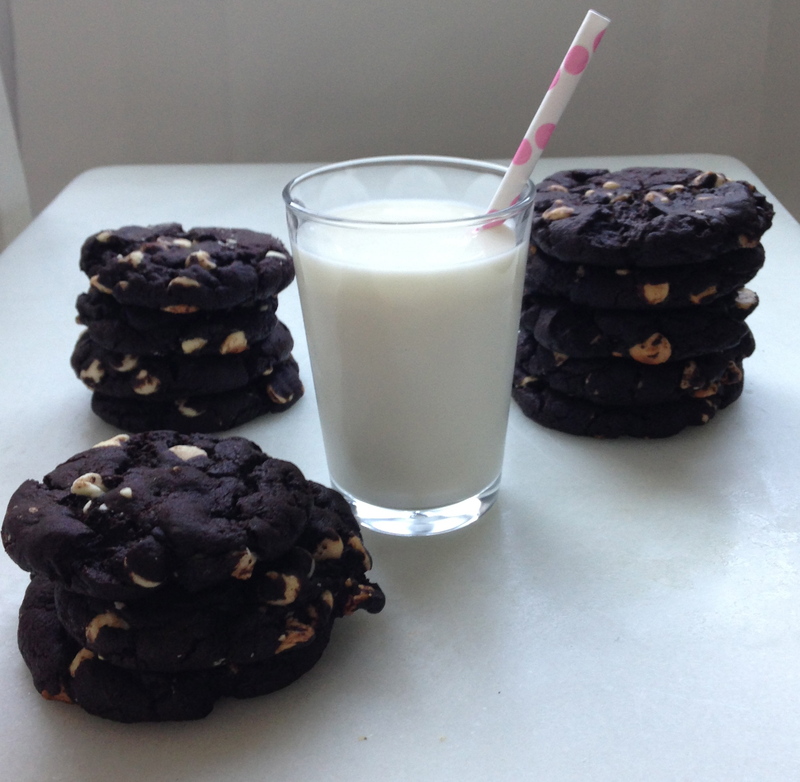 These cookies beg for a glass of milk! I just had to take a bite! In a medium bowl, whisk the flour, baking powder, salt, and cocoa powder. In the bowl of a stand mixer fitted with the paddle attachment, beat the butter on medium-high speed until it is light and fluffy. Add in the sugars and cream with the butter until well incorporated. Mix in the vanilla. Add ½ the flour mixture and stir well. Add in the milk, and mix well. Add in the rest of the flour and mix until fully incorporated. Stir in the white chocolate. Chill the dough for 15 minutes (or longer). In the meantime, preheat the oven to 325 degrees F.
Scoop the dough onto a parchment lined cookie sheet, about 2 Tablespoons of dough for each cookie. Press down on the dough ball slightly. Bake for 12 – 16 minutes. Let the cookies cool completely on the sheet. Looks amazing. Oreos are my absolute fav so I can’t wait to try these out and compare. Perfect weekend task. Thanks, Katie! 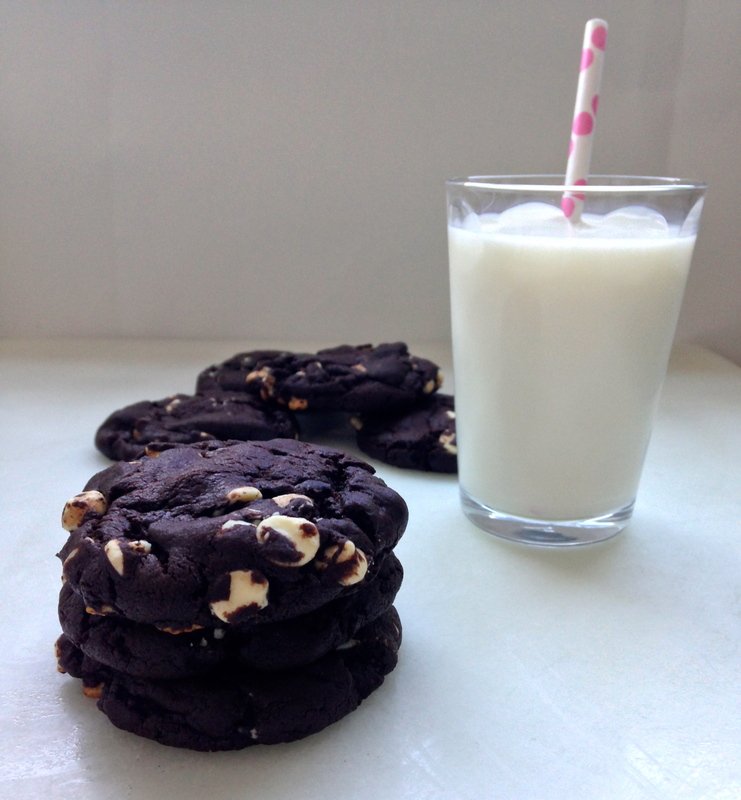 I think you will really like these if you love oreos! Thank you! They were so good, they are already gone!! These look amazing! 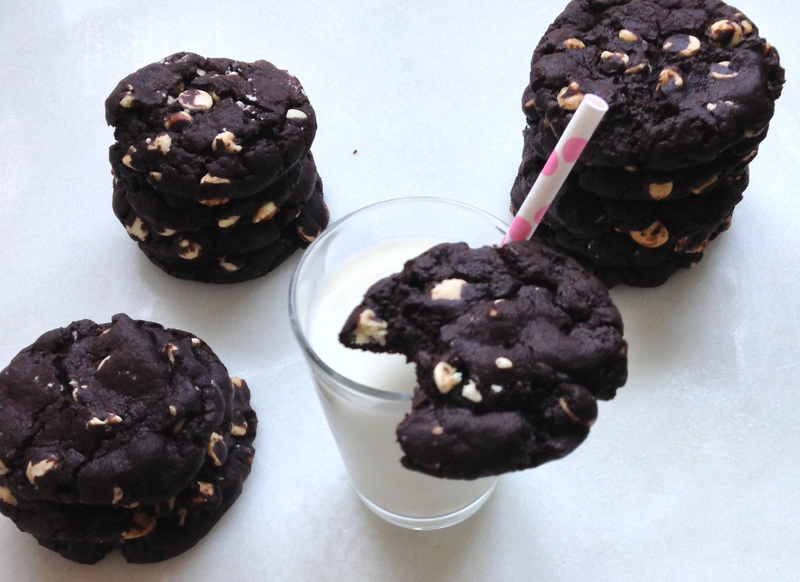 I love Oreos – I made a cookie like this before and they are one of my favorites! Thanks, Sally! 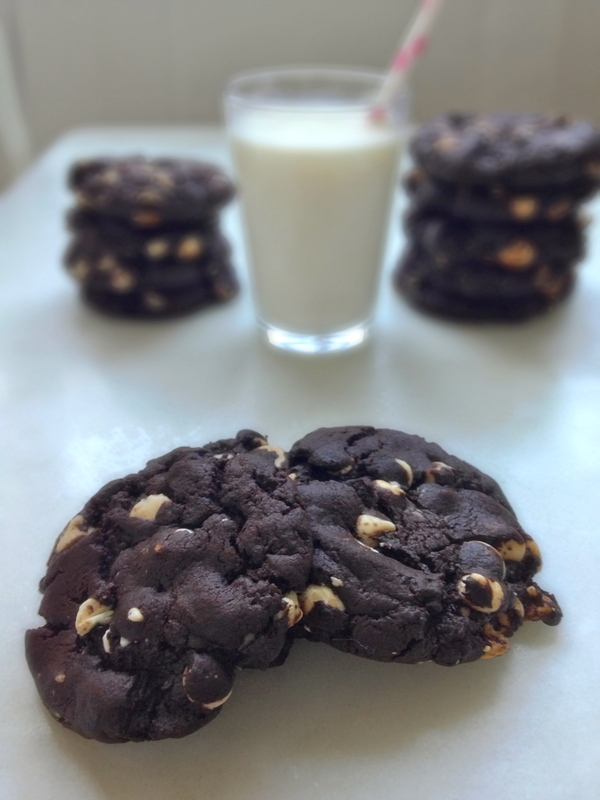 These cookies quickly made it to my top 10 list! The Hubs would love these. He has a thing for oreos! Oh you def have to make them for him!! He will love them!! Thank you so much Jorie!! 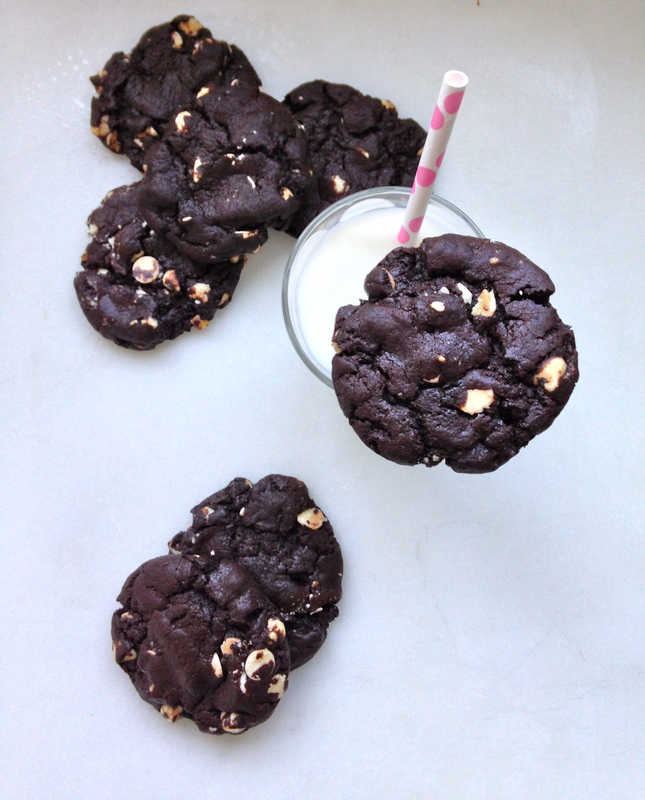 I need to make these cookies again soon – we ate them way too quickly! 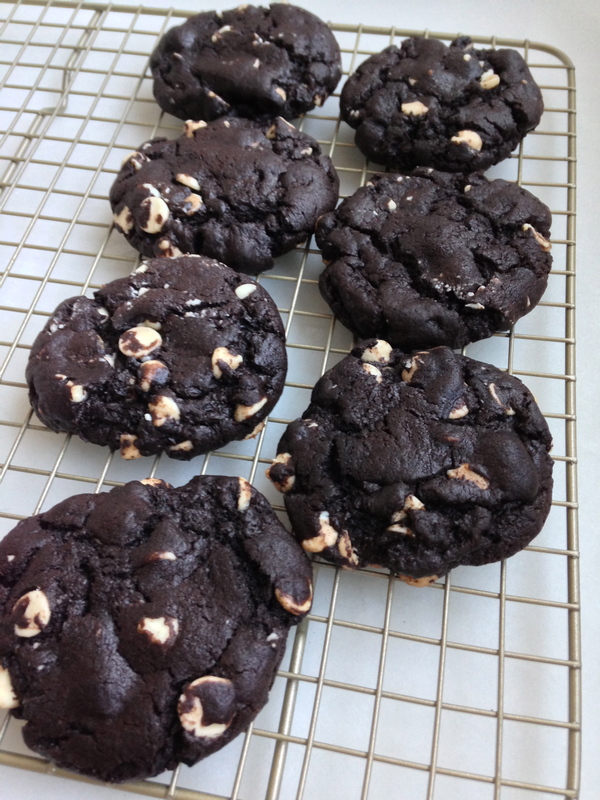 I love those white chocolate chips peeking out of the dark chocolaty cookie! Yum! Yummy! 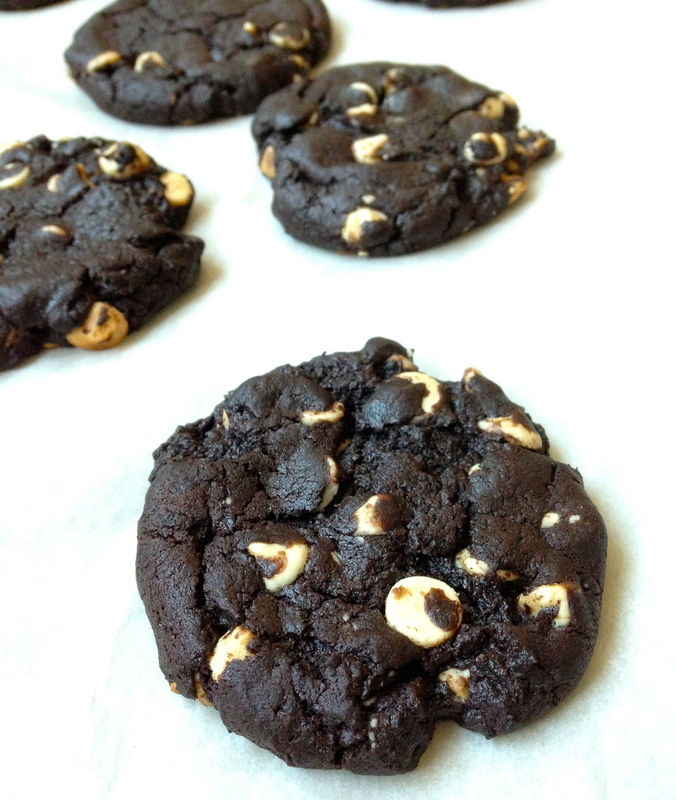 I made them with a gluten free flour blend and they turned out awesome! I’m so glad they turned out well, Courtney! These are my favorite cookies ever! I used a gluten free flour blend (cup4cup) and it worked awesome. Thanks!